For Montenegrin footballer, see Aleksandar Vujačić (footballer). Aleksander "Sasha" Vujačić (Serbian Cyrillic: Александр Саша Вујачић, pronounced [aleksǎːndr sâʃa ʋǔjatʃitɕ], Slovene: Aleksander Saša Vujačič, rendered in English as Sasha Vujacic; born March 8, 1984) is a Slovenian professional basketball player for Scaligera Basket Verona and two-time NBA Champion with the Los Angeles Lakers. Vujacic was selected by the Los Angeles Lakers in the first round of the 2004 NBA draft with the 27th overall pick. In the 2007–08 season, Vujacic set the Los Angeles Lakers single-season record for the best three-point field goal percentage (.437) in a single season. Vujacic is also a two-time Turkish Basketball League All-Star and a Turkish Basketball League MVP. From 1998 to 2000, Vujačić played for Branik and Polzela. The following year, he played for the Snaidero Udine junior team, before joining the senior team in 2001. Vujačić played for the Slovenian junior national team and won a silver medal at the 2002 European Junior Championship. From 2001 to 2004, Vujačić played for Snaidero Udine of the Italian Lega Basket Serie A.
Vujačić was drafted by the Los Angeles Lakers with the 27th overall pick in the 2004 NBA draft.He signed a multi-year deal with the Lakers on July 20, 2004. He recorded a then-career high 22 points in a win over the Denver Nuggets on November 29, 2007. In the 2007–08 season, Vujačić made 118 of his 270 three-point field goal attempts, setting the Los Angeles Lakers single-season record for the best three-point field goal percentage (.437). During Game 3 of the 2008 NBA Finals, Vujačić scored a career playoff-high 20 points off the bench and was the only Laker, with the exception of Kobe Bryant, to score in double figures. The Lakers went on to lose the series in 6 games to the Boston Celtics. On July 28, 2008, Vujačić re-signed with the Lakers to a multi-year deal. Los Angeles made it back to the NBA Finals to face the Orlando Magic. The Lakers defeated the Orlando Magic in the 2009 NBA Finals in a 4-1 series, earning Vujacic his first NBA championship. In Game 6 of the 2010 NBA Finals, Vujačić led the Lakers' bench with 9 points, including two three-pointers. With 11 seconds left in Game 7 and the Lakers leading by only two points, Vujačić helped made two crucial free throws that sealed the Lakers' victory over the Celtics in a Game 7 for the first time in the longstanding Lakers-Celtics rivalry. On December 15, 2010, Vujačić was traded to the New Jersey Nets in a three-team trade involving the Lakers and Houston Rockets. Vujačić tied his career high of 22 points on January 1, 2011. On February 9, 2011, Vujačić set a new career high with 25 points in a win over the then New Orleans Hornets. In July 2011, he signed a two-year contract with Anadolu Efes. In his first Euroleague season he averaged 13.9 points and 3.3 rebounds per game. On August 6, 2012, it was confirmed that Vujačić would stay with the team for one more season. In a Euroleague game against EA7 Milano on November 16, he scored 29 points, leading his team to a 77–71 victory. He averaged 12.8 points and 2.7 rebounds per game across ten regular season games. Vujačić helped Efes advance to the Top 16 round, edging Cedevita on the road by 81–73 in one of the most crucial games in group C.
On February 3, 2014, Vujačić signed a 10-day contract with the Los Angeles Clippers. He did not re-sign with the Clippers the first 10-day contract expired. On March 25, 2014, Vujačić signed with Italian team Reyer Venezia Mestre for the rest of the 2013–14 season. He played 5 matches with the team, scoring 11 points per game. On October 28, 2014, Vujačić signed with the Spanish team Laboral Kutxa for the rest of 2014–15 season. He left the team on December 30, 2014. On January 2, 2015, he signed with İstanbul BB of Turkey for the rest of the 2014–15 Turkish Basketball League season. On August 7, 2015, Vujačić signed with the New York Knicks. He made his debut for the Knicks in the team's season opener against the Milwaukee Bucks on October 28, recording 11 points, 6 rebounds, 3 assists and 4 steals in a 122–97 win. On March 9, 2016, Vujačić scored a season-high 23 points to help the Knicks defeat the Phoenix Suns 128–97. Vujačić re-signed with the Knicks on July 14, 2016. On February 1, 2017, he made Knicks history by converting two four-point plays during the Knicks 95–90 win over the Brooklyn Nets. Vujačić signed with Italian club Auxilium Torino for the 2017–18 season on August 29, 2017. On February 18, 2018, Vujačić scored the game-winning layup to win the 2018 edition of the Italian Basketball Cup with Fiat Torino, beating Germani Basket Brescia 69–67 in the Finals. In addition playing basketball, Vujacic is involved in several entrepreneurial ventures. In 2010, Vujacic and his family harvested the first grapes at their boutique winery, S&G Estate, located in Paso Robles, California. The winery specializes in Bordeaux-style blends that are marketed under the label Aleksander Wine, which was officially launched in 2017. Some of the early vintages have scored highly in wine reviews, with the 2011 vintage earning a 95/100 rating by Wine Enthusiast. 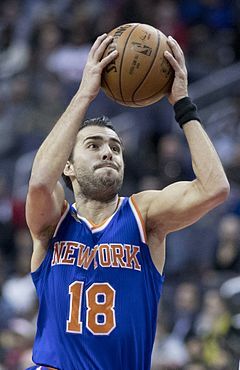 The name ‘Aleksander’ was chosen by the family and inspired by Vujacic's official birth-name. Vujacic is not the only NBA athlete to own a wine label. Dwyane Wade and Yao Ming also produce wines under their own labels. In 2018, Vujacic became the official Ambassador of the new Japanese basketball team, Saga Ballooners. In his capacity as Ambassador, Vujacic oversees the Ballooners basketball operations and helps to promote the sport of basketball in Japanese culture. In the same year, Vujacic's brother, Aljosa Bjekovic, was appointed as Playing Head Coach. Vujačić was born in Maribor, Slovenia, to a Serbian father and Slovenian mother. His father was a Serbian basketball coach, while his mother was a Slovenian volleyball player. His mother was playing volleyball for a top Yugoslav women's club, Branik Maribor, but quit her career at the age of 19 when she got pregnant with Sasha. His parents divorced when he was 6, and he lived with his mother and soon afterwards with his stepfather. He has two siblings, a sister named Sara, and a brother named Aljoša. In addition to playing basketball, he enjoys volleyball, tennis, and soccer. He was once engaged to professional tennis player Maria Sharapova, but the two separated in 2012. Vujačić's nickname "The Machine" was coined by TV journalists Joel Meyers and Stu Lantz. ^ mš (February 17, 2012). "Deset odvetnikov usklajevalo predporočno pogodbo Šarapove in Vujačića" (in Slovenian). dnevnik.si. Retrieved June 3, 2017. ^ a b "SASHA VUJACIC". interperformances.com. Retrieved December 6, 2018. ^ "Kobe watches 4th quarter from bench as Vujacic, Lakers bounce Nuggets". ESPN.com. November 29, 2007. Retrieved February 3, 2014. ^ "LAKERS RESIGN FREE AGENT SASHA VUJACIC". NBA.com. July 28, 2008. Retrieved February 3, 2014. ^ "Vujacic Sasha 2011/12 Season". Euroleague. Retrieved December 31, 2012. ^ "Sasha Vujacic staying with Anadolu Efes Istanbul". Sportando. Retrieved December 31, 2012. ^ "Vujacic stars as Anadolu Efes holds off EA7 Milano". Sportando. Retrieved December 31, 2012. ^ "Vujacic Sasha Seasonal stats". Euroleague. Retrieved December 31, 2012. ^ "Game report". Euroleague.net. Retrieved December 31, 2012. ^ "Farmar, Vujacic lead Efes into Top 16". Sportando. Retrieved December 31, 2012. ^ "SASHA VUJACIC SIGNED TO 10-DAY CONTRACT". NBA.com. February 3, 2014. Retrieved February 3, 2014. ^ "Reyer Venezia announced Sasha Vujacic". Sportando.com. March 25, 2014. Retrieved March 25, 2014. ^ "Umana Reyer Venezia stats". eurobasket.com. ^ "Laboral Kutxa lands Vujacic for remainder of the 2014-15 season". Euroleague.net. October 28, 2014. Retrieved October 28, 2014. ^ "Sasha Vujacic se desvincula de Laboral Kutxa Baskonia". ACB.com (in Spanish). December 30, 2014. ^ "Knicks Sign Sasha Vujacic". NBA.com. August 7, 2015. Retrieved August 7, 2015. ^ "Williams scores 24, Knicks beat Bucks 122-97 in opener". NBA.com. October 28, 2015. Retrieved October 28, 2015. ^ "Vujacic, Anthony lead hot-shooting Knicks past Suns". NBA.com. March 9, 2016. Retrieved March 10, 2016. ^ "Knicks Re-Sign Sasha Vujacic". NBA.com. July 14, 2016. Retrieved July 14, 2016. ^ "Porzingis, subs rally Knicks to 95-90 victory over Nets". ESPN.com. February 1, 2017. Retrieved February 2, 2017. ^ "Fiat Torino officially signs Sasha Vujacic". Sportando.com. August 29, 2017. Retrieved August 29, 2017. ^ "Basket, Final Eight: Torino-Brescia 69-67. Storica prima dell'Auxilium" [Basketball, Final Eight: Torino-Brescia 69-67. Historical first time for Auxilium]. gazzetta.it (in Italian). February 18, 2018. Retrieved February 18, 2018. ^ Prominent Slovenian Athletes in the United States by Embassy of the Republic of Slovenia, January 2007. ^ a b c "Rojen na dan žena" (in Slovenian). vujacic.net. Archived from the original on July 16, 2011. Wikimedia Commons has media related to Sasha Vujačić. This page was last edited on 19 April 2019, at 20:39 (UTC).